Mt. Soraksan Nature Reserve is part of the Tentative list of Republic of Korea in order to qualify for inclusion in the World Heritage List. Being practical, there are important options to consider for any traveler to this national park. You could spend 1-2 hrs, take a cable car to a splendid view, check out a Giant Buddha statue, and grab a snack. For 3-5 hrs you could do all of the later, and add the Ulsanbawi hike (enormous granite rock formation), and perhaps even a waterfall. If you have a full day, or better yet 2 days, you can hike into the isolated interior of the park to see an expansive wilderness. Seoraksan is one of those national parks (like Yosemite) that pays off if you stay and explore. The entrance of the park, and nearby facilities are quite busy, full of families and serious hikers in equal measure. Don't be discouraged, this park does have wild areas, you just have to invest a bit more time to see this iconic Korean landscape. Seoraksan is notable for its rugged peaks, numerous waterfalls, and huge granite boulders. The park also has some pleasant Buddhist temples. When considering world heritage, Seoraksan National Park has only 2 options. It will not be inscribed by itself, this is clear (already rejected twice). Now, there is one encouraging development that might yet bring world heritage status to this iconic landmark in Korea. If you are not familiar with the Baekdu-daegan Range, than it might be worth researching for any outdoor-minded traveler to Korea. The Baekdu-daegan is the mountain range that spans the Korean peninsula from Mt. Baekdu (North Korea/China Border) all the way down to Jirisan National Park in South Korea (1700km). This range is the watershed ridge of Korea, it is never broken or crossed by water. While the Northern portion includes several celebrated mountain regions, much is wilderness. In South Korea, the Baekdu-daegan is connected by 7-8 national parks. I've visited 5 of them, and each was well-worth my time. 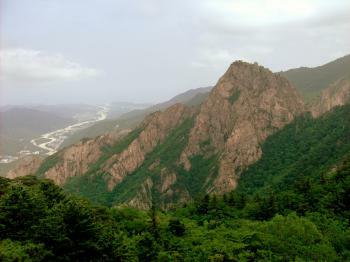 Seoraksan is probably the most well-known (along with Jirisan) of the South Korean peaks on the Baekdu-daegan. With such an expansive property, the Baekdu-daegan would be a very ambitious conservation project. While the South Korean portion is essentially already well-protected nationally, and the trail is even well marked in places, the Northern portion would require years of research, documentation, management plans, boundary clarifications, and much more. I would personally be thrilled to see such a designation, it would protect the most important interior habitats in Korea, the most pristine land, and some of the most scenic areas in the country. There has been discussions recently to pursue world heritage status for the Baekdu-daegan, it could process along more in the coming years. The second possibility and one that could potentially be pursued far more readily than a Baekdu-daegan nomination, is a joint nomination of Mt. Kumgang and Seoraksan. This proposal has been floating around quite a bit recently. Both National Parks are already on tentative lists an they protect part of the same mountain range and habitat. Moreover, it would bypass some of the more difficult challenges of a DMZ transnational nomination, both national parks while close in proximity, do not share a border with the DMZ. Essentially, if North Korea and South Korea could just agree on making the joint nomination, in which both parks would be a single WHS managed separately, than perhaps this nomination could be a symbol of cooperation. It would almost surely apply as a mixed nomination, and I would be very optimistic on the chances for inscription. Mt. Kumgang would certainly strengthen the case for OUV, and South Korea would inevitably create an excellent management plan and nomination dossier. Mt. Kumgang even has basic tourist facilities for the determined traveller and there has been talk of reopening tours. We shall see, in the meantime, if you have the chance, visit these wonderful national parks in both Koreas!